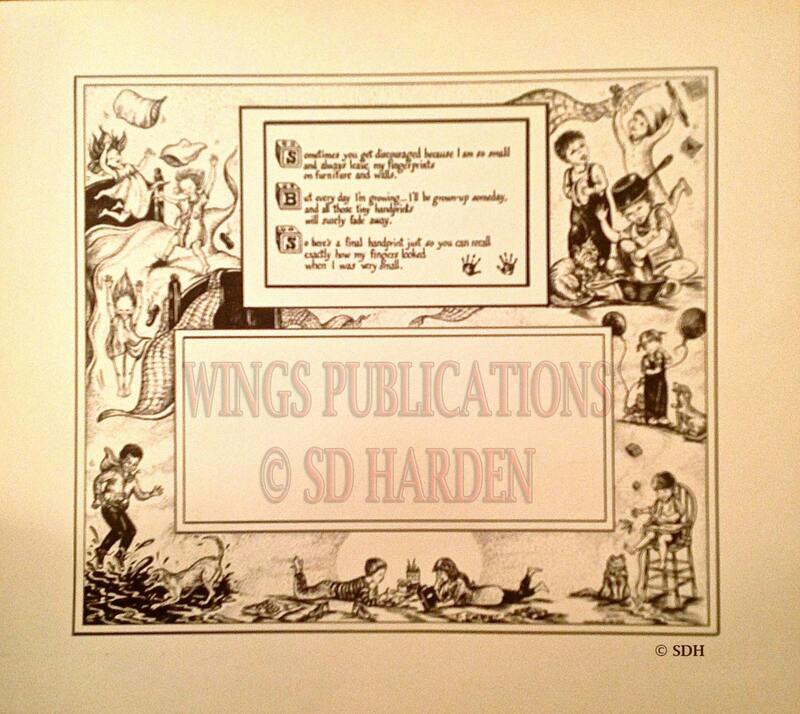 If you are a fan of old style, whimsical pen & ink children’s book illustrations then you will love this print that I illustrated to go with the traditional Children's Handprint Poem that has been handed down for generations. 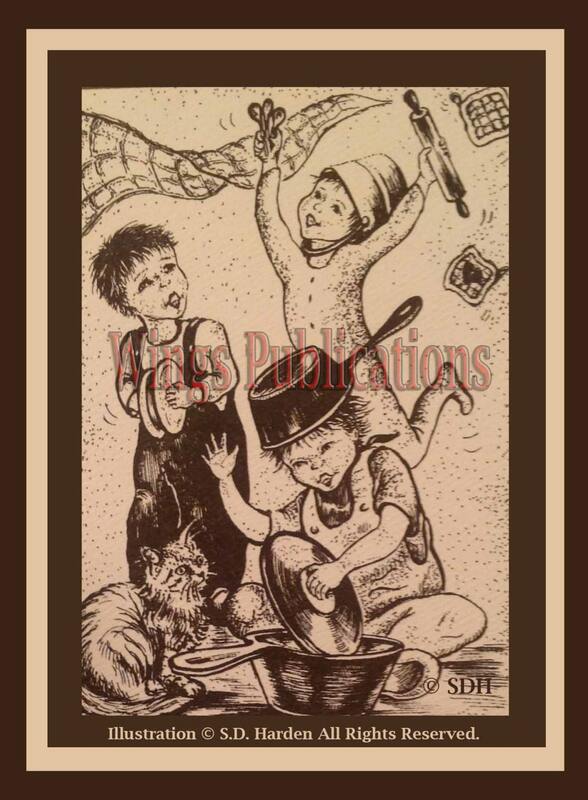 The border is decorated with little vignettes of children doing all sorts of things that children do: from girls jumping gleefully on a bed, to boys making music with kitchen pots and pans, to a child jumping in mud puddles with his puppy and more! 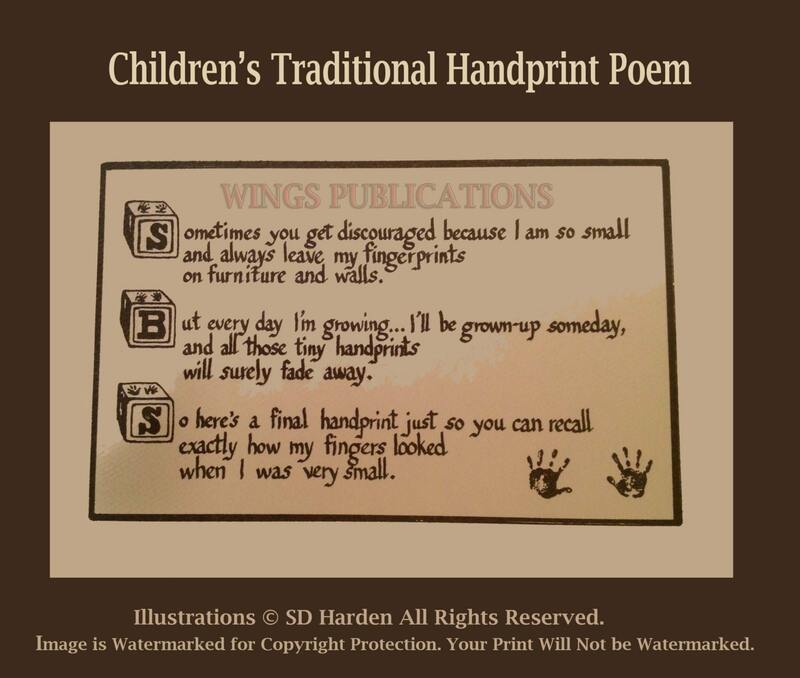 There are many versions of the traditional Children’s Handprint Poem. 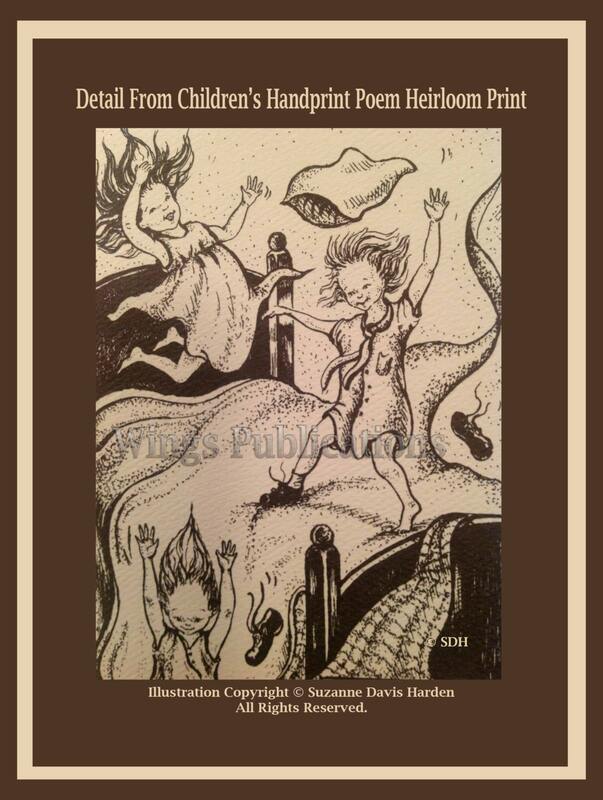 These poems have been used in myriad ways by many people, from schoolteachers to professional artists and craftspeople for years to remind us all of how quickly our children grow up. 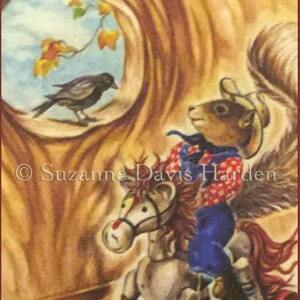 I created this print several years ago for my own children when they were young and for all my little nieces and nephews. I cherish the handprint I saved of each of my children on my print as do all those who have their own copy. These beautifully illustrated prints make great gifts and will be treasured for a lifetime once you record your child’s (or grandchild’s) handprints on them. *Included with the print are directions for correctly placing your child’s (children’s) handprints onto the space provided. 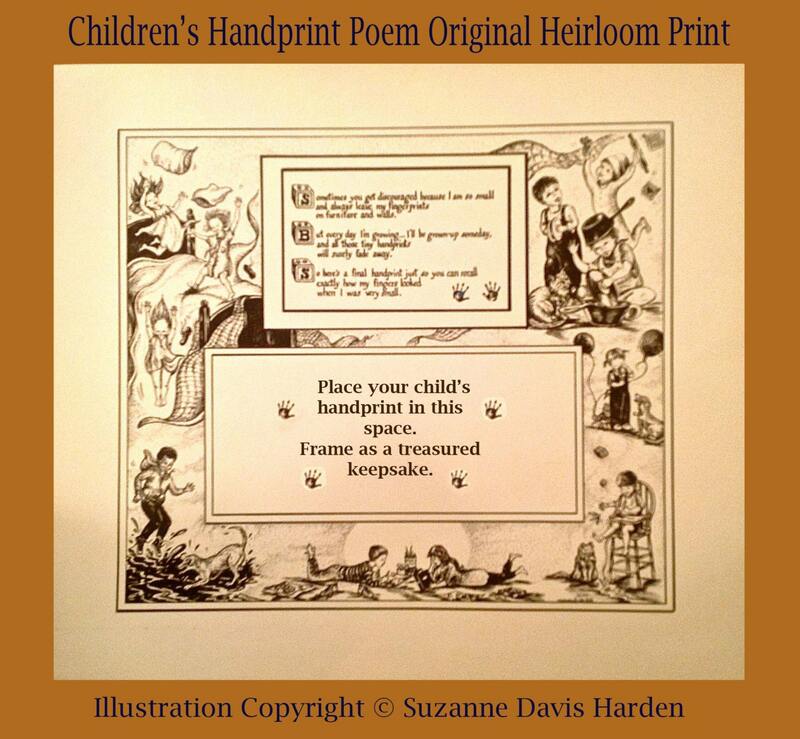 The Children's Handprint Poem Heirloom Print measures 16" inches x 20" inches and can be matted and framed in a standard 16" x 20" frame or larger. 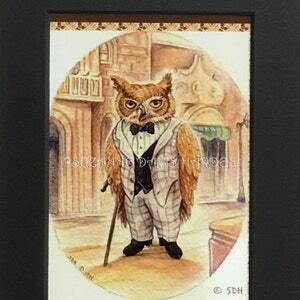 I will ship your limited edition print to you carefully sealed in a flat box via Priority Mail to ensure that you have your prints handled with the best possible care and delivered to you in a timely manner. ****In the photo the prints are Watermarked for Copyright protection. 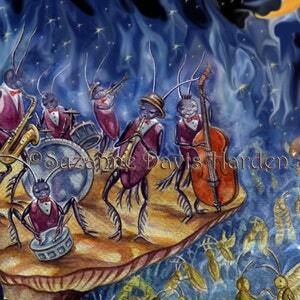 Please be assured that your Print will NOT be watermarked!